The International Boxing Association (Aiba) has dropped a number of officials after a review of their decisions at the Olympics. 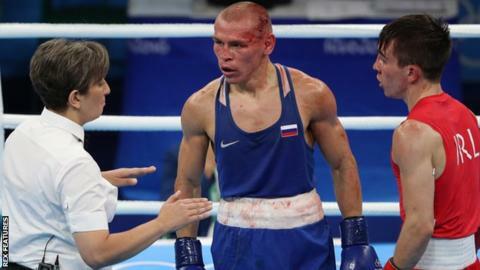 Aiba said that, after 239 bouts in Rio, “less than a handful of the decisions were not at the level expected”. The body has admitted it is in a “transition process”, but said results of bouts already contested will stand. The reaction to Irish fighter Michael Conlan’s controversial defeat prompted a reaction from Aiba. Conlan lost by unanimous decision to Russia’s Vladimir Nikitin when many observers felt he had won comfortably. “We have a lot of educating to do and a lot of evaluating to do,” Aiba official Tom Virgets told the BBC. Aiba, which governs amateur boxing, has changed several rules for the Rio Games – allowing professionals to compete, removing the headguard, scrapping the appeals process and changing the scoring system. Five officials judge each bout and a computer randomly selects three whose scores are counted. Traditionally, judges would use a computer scoring system to count each punch. But now the winner of each round is awarded 10 points and the loser a lower number, based on a criteria which includes the quality of punches landed, effective aggression and tactical superiority. “We’re getting better but Rome ain’t built in a day and we’re going to continue to raise that bar of excellence,” insisted Virgets, a member of Aiba’s executive board and chairman of its disciplinary committee. There was also controversy when Russian world champion Evgeny Tishchenko was awarded all three rounds in his favour against Kazakhstan’s Vassiliy Levit in the men’s heavyweight final, despite a cut to his head and spending much of the bout on the back foot. Tishchenko was booed by the crowd after being given the unanimous points decision. Irish official Michael Gallagher was one of the judges in the heavyweight final. Virgets said of his reaction: “I can understand that frustration is heightened when there is a significant amount of media who also believe that he should have won. Conlan’s defeat prompted a five-year-old boy from Dublin to offer him his school medal as a consolation “because you are a winner”.